Top basket designed to hold up to 75 legal file folders (not included); Bottom shelf that accommodates parcels to make your mail distribution more efficient. Experience smooth movement on 4" swivel casters (2 locking). 600 lb. weight capacity. 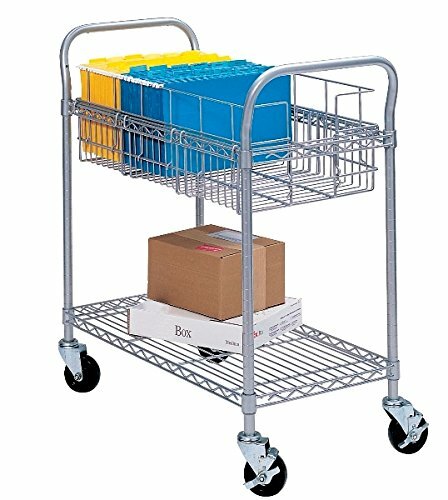 This wire cart is great for moving mail or packages from one destination to another. But it"s not just for the mail room. Use to transport packages, media, books, files or any objects that are a handful. Have available for use in your library, media center, mail room, server room, ware house, assembly areas, trade shows and print stations. It"s for sure a speedy delivery with this cart!